Growing up in Florida meant that I always wore sunscreen and always had multiple pairs of sunglasses within my reach. Living in Texas now, it’s pretty much the same routine. My favorite pair of sunglasses is a polarized pair of Ray Bans that I have owned at least 7 years now, which is rare in sunglass land. When I stumbled upon these Gator shades from Society 43, I knew I would be adding them to my collection soon! 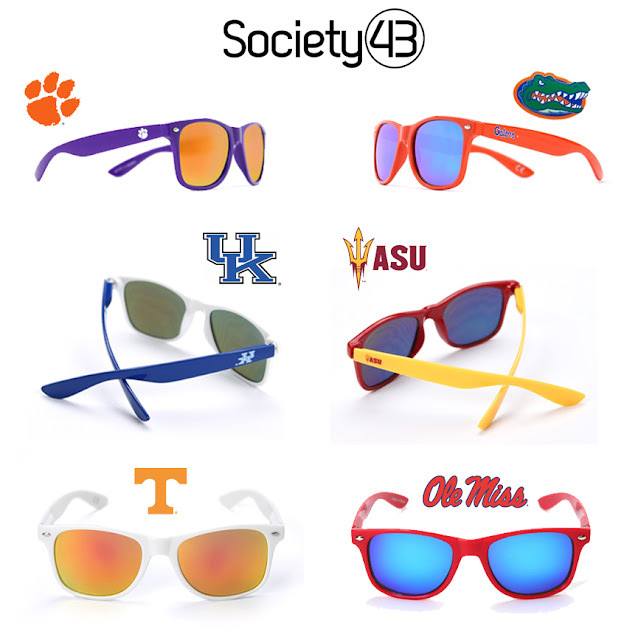 Society 43 offers 61 different NCAA schools available in their Game Day shades, in multiple color combinations. The throwbacks are such a cool design. All of their sunglasses offer 100% UV protection, which I cannot stress the importance of. UPDATE: Use code "StylishGameday" at checkout for 15% off. The code ends 4/18. i LOVE these!! but i am so sad they dont have oklahoma sooners sunglasses yet, i was gonna order some for my bf! I am in the same boat! I wanted to buy some Sooner sunglasses for the hubby too.I am going to inquire with the company and see if I can't find out when they may carry them. I will let you know.